How about making a different kind of Christmas cookie this year? If you visit Greece close to Christmas, you’ll eat far too many of these delicious Christmas honey cookies. Imagine a cross between baklava and an ooey, gooey pecan pie and you’ve got these. I’m addicted! It’s been a few years now since I spent a run up to Christmas in Greece (sadly! 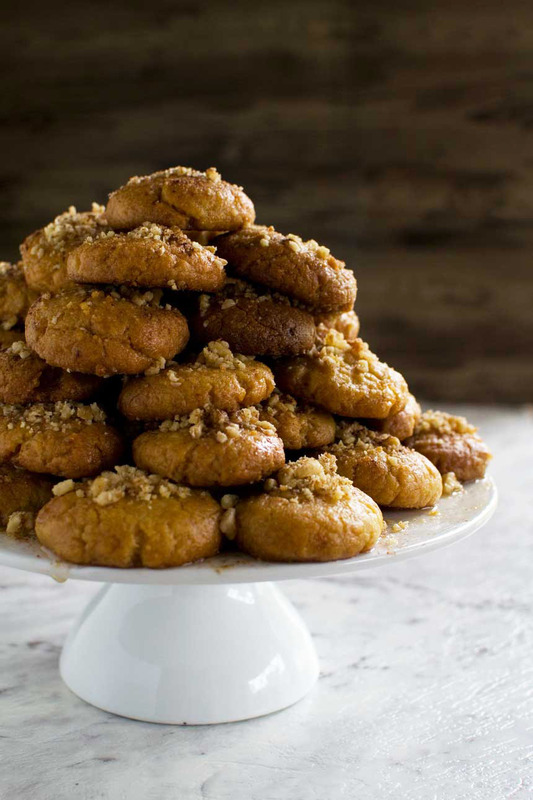 ), and one of the things I miss the most are these fabulous Greek Christmas honey cookies. Every self-respecting Greek household has a huge pile of these on their Christmas treat table. bites of sheer delicious. You simply cannot stop at one. I think I ate at least 4 of them while making them. Oops. I always loved the moment these started appearing in bakeries in Athens some time during November. I warn you, they are seriously addictive. I’m not sure I’d go as far as to say that they are healthy treats, but half of the sweetness is honey and they’re made with a mix of olive and vegetable oils, not butter. They’re also dairy free, for anyone that’s important to. 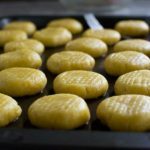 When you first taste these with their syrupy, gooey texture and Christmas spice flavour, you might think they’re difficult to make. But they really aren’t. The cookie dough comes together well and is easy to shape (see video below). The only ‘bit’ of this recipe that may seem like harder work than you usually find around here is the syrup. And really that’s easy too. Just boil up sugar and honey with a few Christmassy flavours (yummy) and you’re done. Once the cookies are baked, you float them in a simple syrup until they soak plenty up. Then you press crushed walnuts into the top and sprinkle over cinnamon. I find there’s usually a little syrup left over after you’ve floated all the cookies in it. Don’t throw it away! Drizzle it over the cookies for a bit of extra moisture and flavour. The cookies don’t go soggy, but they do get gooey-er and squidgy-er as time goes on. In a really good way. In fact, they stay good for AGES, a bit like British Christmas cakes and puddings. This means they’re perfect for making ahead. Make them a week or two before Christmas and they’ll still be delicious at New Year. 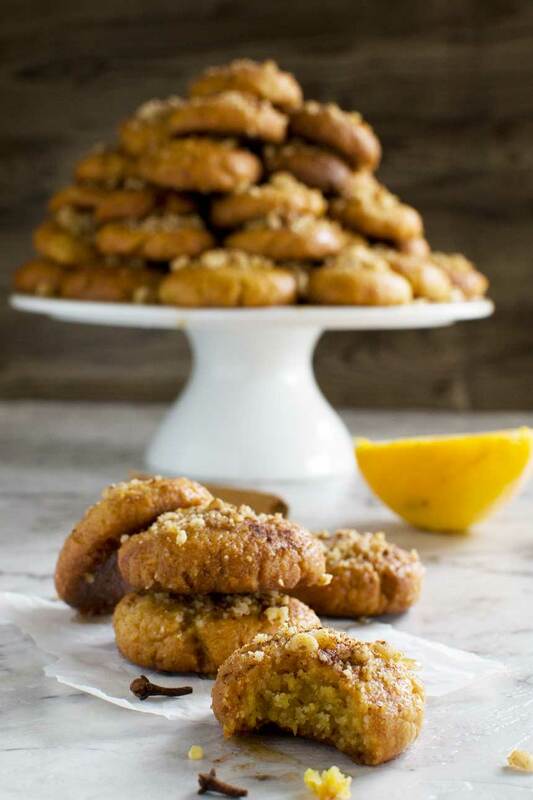 Greek Christmas honey cookies also make great Christmas gifts. I love to package them up in boxes to give to family and friends. I first published this post at Christmas 2013 but these cookies are so good I decided to update the recipe with new photos and a video to show you exactly how to make them. I was heavily pregnant this time last year and didn’t quite get around to making any of these cookies. This year I’m making up for it! I made a first batch a few days ago, thinking that would be plenty. I’d gift some and keep the others for ourselves. Hmm. Great in theory. Somehow we only have a few left. Oops, better make some more. I hope you find this video helpful if you’d like to try making these! 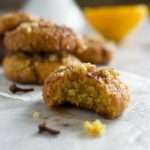 I do hope you agree that these delicious Greek honey cookies are worth a try this festive season! But if they really don’t seem like your sort of thing, try these gingerbread muffins with salted caramel frosting instead. They’re just as delicious. Mmmmm! 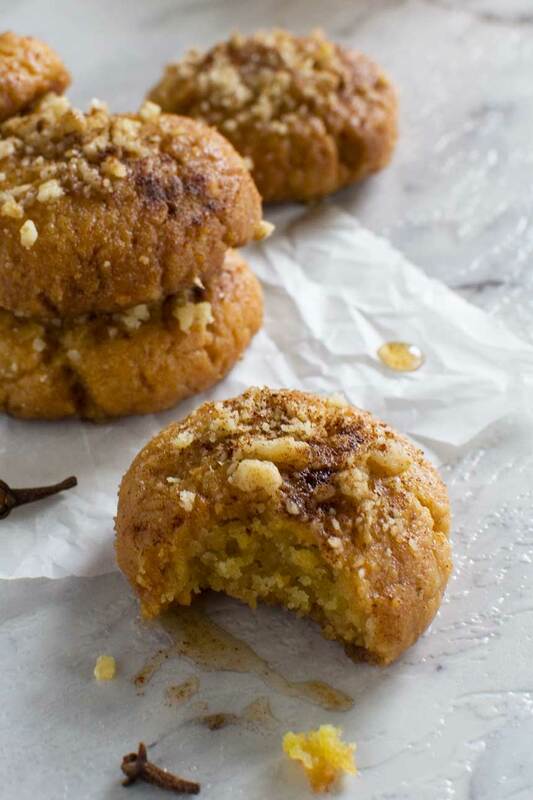 Gooey, sticky traditional Greek Christmas honey cookies with delicious festive flavours. There's no way you'll be able to eat just one! Zest the orange, then combine the zest with the sugar in a large bowl. Pour the oils into the sugar/orange mixture and beat until well combined. Then add the orange juice and brandy and beat again. 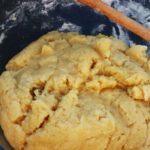 Sift the flour with the baking powder and baking soda, then add to the liquid little by little until a stiff, wet dough forms. Pull off a walnut-sized piece of dough and shape it into a ball / oval in your hands, then place it on a baking sheet. Use a fork to flatten the dough and make a criss-cross pattern on it. Keep shaping and flattening balls of dough until it is all used up. Bake for 25-30 minutes until the cookies are lightly browned. While they are in the oven, make the syrup. Combine the honey, sugar, water, cinnamon, lemon peel and cloves in a saucepan, then bring to the boil. At this point, simmer uncovered for about 10 minutes until the syrup has thickened slightly. Then take out the cinnamon, lemon peel and cloves and stir in the lemon juice. Then, while the cakes are still very warm, float them in the syrup a few at a time, turning them over to make sure they soak up plenty of liquid. After about 30 seconds, take the cookies out with a fork or spoon with holes in, put them on a serving plate and press some walnuts into the top. Lastly, sprinkle a bit of cinnamon over them. Once you've covered your plate, you can pile the others on top of each other if you like - this is how they are usually sold and served in Greece! Recipe slightly adapted from this one on About.com. 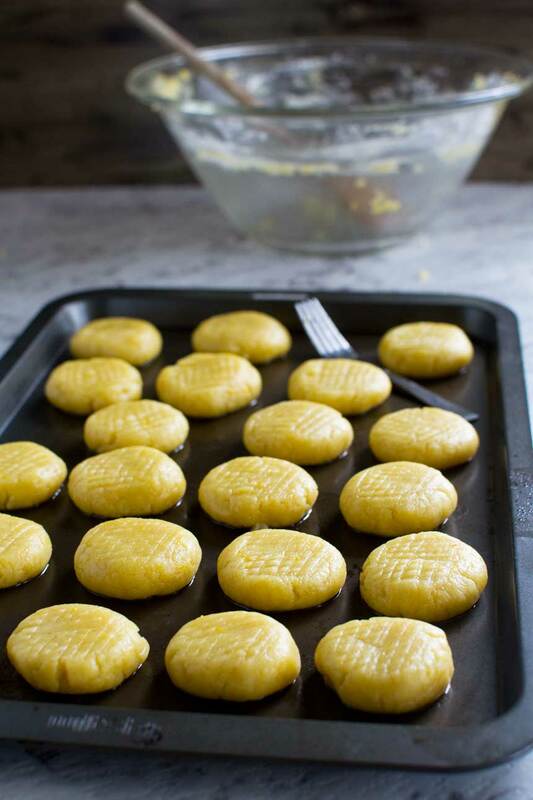 Don't keep these Greek Christmas honey cookies in the fridge. They are better kept in an airtight container at room temperature. Also, don't pour away any leftover syrup. Simply drizzle it all over the top of the cookies. The more syrup sinking into these babies the better! You can also confidently make them well ahead of Christmas (or any time you like really) as they will last for about a month. They actually get better after a few days after all the lovely syrup has sunk in. 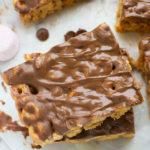 Addictive peanut butter Cheerio bars No bowl chocolate pecan bars recipe (magic bars) Easter chocolate bark (with a video) Chocolate lollipops (homemade food gift with video) Chocolate-dipped Oreos (with a video!) 11 easy homemade chocolate gifts The easiest peanut butter cups in a jar (homemade food gift!) Toffee apple chocolate bark Eton Mess fridge cake Biscoff & white chocolate blondies ‘Hot cross bun’ truffles Chocolate stout cupcakes with peanut butter frosting Coconut & pistachio chocolate heart & star cookies FIVE last-minute chocolate gift ideas! Love the “magic button’ – US/metric conversion! Cookies look very good will definitely have s go! Magic button – great description! Yay! So glad you’re going to have a go at these, Rosemary. I really hope you like them as much as we do! I’ve had these cookies at Greek festivals but have NEVER made them myself! 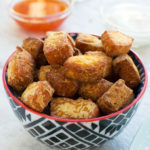 Normally we make kourabiedes but I think we need to add these to the holiday list. These look so amazing Helen! Hi Marcie. Thank you so much for popping by – it’s always lovely to hear from you and I must pop by your blog some time! I do like kourabiedes too (so pretty!) but I always found them a bit more hit and miss when I lived in Greece. I LOVED melomakarona and am so happy I’ve figured out how to make them taste the same as they always did in Greece. These cookies are new to me, Helen. The flavor combination and texture are absolutely mouthwatering! Thanks so much, Marissa. I hope you give them a go some time. I think you’d love them with your lean towards all things Southern Europe! These sound amazing! I love baklava so I know I’d fall hard for these, too!! I knew you’d appreciate these, Liz. Hope you have a great holiday! I love everything about this, all my favorite textures and flavors. I think I’d make these anytime. Merry Christmas Helen. Thank you! Hope you’re having a great holiday break too, Janette! This looks so delicious and I think I’ve had cookies like this at Greek festivals. I want to make them this weekend. I don’t see how the walnuts stick and stay on top. It seems like they’d just fall off. Is it crazy to put ground up walnuts in the cookie instead of on top? Hi Sara, so happy you’re going to give these a whirl! Don’t worry about the walnuts sticking on. They do, because the cookies end up being quite sticky after you dip them in the syrup. Also, it doesn’t matter if a few of the chopped walnuts fall off the cookie (they will). If you have them all stacked on top of each other they’ll just fall onto another cookie. This is just how melomakarona are. All sticky and messy, and that’s fine. Just chop the walnuts quite finely in a food processor and sprinkle just a little onto the top of each cookie. You want just a hint of walnut crunch on the top. I wouldn’t really advise adding the walnuts to the cookie dough because it might change the consistency of it. Also, I think the flavour would get lost. It’s just not necessary. Give the cookies a go as they are and see what you think!!! You were right -the nuts just kind of stuck. So delicious. Thanks! Awesome! Thanks so much for taking the time to let me know. I’m so glad you like them! I would love to try these but we have someone with a nut allergy. What would you recommend as a substitute for the walnuts on top? Hi Andrea! I’m so glad you’d like to try these! I’d say just don’t worry about the nuts on top. The recipe doesn’t depend on them. Just leave them out. The cookies will still be absolutely delicious! Good luck! I have never visited Greece but your instructions make me very interested in this. Maybe I will try this out. Thanks for the recipe. Hi, Susan! Please do try these out. They’re addictive, last ages, and they’re also great to give as gifts. Let me know how you get on! YUM!! These look incredible! I will be making them this weekend with my daughters who love to bake!! So happy to hear this, Krissy! I think you’ll love them! Thank you so much for sharing the Greek treasures! I am Greek and I can never resist the recipes.. I was surprised to see that our treats have become popular in other places as well! I am so glad you love them! Some notes if you are interested of taking some advise from a Greek person who is trying to master such recipes even living abroad..
1. It is really crucial to not work the dough very much. In fact the dough that I am doing (a bit different than the one here since there are always some differences in each household) would only take about 10secs to be worked by hand and not vigorously at all. The more gently you are with your dough and the less you work it (just to barely blend everything together and this is it for a few seconds) the better it is since otherwise the oils are coming on top if that makes sense after a while and we do not want that. 2. We make sure that if we need to let the dough to rest because we have something else to do, first we actually form all those small pieces that we will need to have them ready for the oven and separated. If we leave the whole thing standing for a while again the oils will come up on top and we do not want that. If you separate the pieces it is fine to leave them for a while but again do not think that you can leave it for hours or the next day; ideally you want to prepare them once and for all and not let them standing a lot. 3. We normally do not really flatten the dough because it flattens by itself a little in the oven so normally we actually weigh each piece for consistency so that all pieces are ready at the same time in the oven (30gr for each one of the pieces) and we just very gently shape them like small sausages if that makes sense so we do not really flatten them; when they are in the oven they tend to flatten a bit and they get their known shape! Again this is a matter of preference though. The shape on the “melomakarona” can be done by using a fork to create holes all over it so this does not really require flattening if that makes sense. Whatever you decide to do just be consistent and make sure that every piece is the same with the others since this will be important when they are baked. 4. If you do not have air in your oven but a conventional oven without air then you will probably need to add only one batch at a time to accomplish the best result. The time if you have each piece at 30gr is about 20-25mins at 190C. 5. The most important thing from all the above is the syrup!!! Please NEVER EVER add warm or hot melomakarona in warm or hot syrup!!! It has to be one of the other! So either melomakarona will be super hot from the oven and the syrup will be super cold (it should have rested in room temperature at least for 3-4 hours until it is completely cold) or melomakarona can be cold and the syrup very warm. This is so that they can soak up all the syrup without breaking! Otherwise they will fall apart if you do not make sure that they are not both hot or cold! 6. There is a final process that some people do not know about.. it is called “meloma” in Greek and it is when you add honey on top of the super hot melomakarona after you have dipped them in the syrup. They way I do them with my dough at least and the most people I know do not need to dip the sweets more than 10-20secs in they syrup. I have cold syrup and very hot melomakarona always and I dip for around 15 mins because this way they hold very well.. they are super juicy but also do not break! You need to experiment a bit for that! So in fact I take them super hot directly from the oven and dip them for 15 secs in the the cold syrup (pressing on top of them so that they are fully covered at all times) and then I let them stand for a little while (it can be seconds or minutes but I do not let them stand much because I need them really hot still) in a place with holes (I really can not think of the English name right now but you get the point). Then I take a plate where I add some honey on its surface everywhere and then add the melomakarona everywhere one by the other, then add lots of honey again so that they are well covered (not covered as if filled with honey up to the top but as if you would add in a waffle..you get the point). This is “meloma”. It might look as if the honey is just sitting on top of the sweet but since it is hot in a few minutes (and this is even better the next days) the honey will just become like another syrup for melomakarono and sit perfectly all over since the syrup does not have enough thickness or honey for the name to stand really and for all the flavors to arise..! Try it and you will remember this crazy Greek person who wrote and essay in the blog.. lol! Then you can add if you want the walnuts and some people decide not to add them at all! It is a matter of choice! I personally love them! These are my pieces of advice! I hope it will help someone who tries and keep failing and does not know the reason why! Best of luck! Keep up the good work! Merry Christmas!!! Oh Magda!!! Thank you SO much for these tips – you can’t imagine how much I appreciate them! You took so much time and care over this comment and I promise you I read it very carefully! This is also perfect timing as I am going to make this year’s batch of cookies TODAY! I will try out some of your tips, and then I will amend my recipe accordingly. It’s very special to receive tips from someone like you who has been making these their whole life. I LOVE melomakarona and hope that I will become as good as you at making them some day!